Global brands spend over $1 Trillion a year on a growing mix of marketing assets, media and technology to grow sales, profits and enterprise value. It’s surprising how little visibility financial executives have into this spending on growth, and how those investments are performing. Particularly in the age of big data and digital marketing. Every effort to measure and improve the contribution of these marketing investments to the business is limited by the ability of finance and marketing to work together to improve the way they currently track, classify, and account for marketing spending. How to count, track, and measure their spending on earned and owned marketing investments – such as content, analytics, technology and digital marketing program investments – that make up most marketing spending today. This fundamental lack of transparency into marketing spending is a big reason why 60% of CEOs are putting pressure on their CMOS to prove the value of marketing. In response CMOs are spending over a billion dollars on marketing measurement including building marketing measurement dashboards and pouring money on marketing attribution, mix and performance management software solutions. These measurement, attribution, and modeling solutions promise to measure the contribution of marketing to tangible sales outcomes and to some degree long term growth and profitability. And while all this effort moves the conversation about marketing in the right direction– the results so far have not been very good. Over three-quarters of the Global 5000 CMOs surveyed by Forbes feel their inability to quantify, communicate and optimize the value of marketing hurts them both professionally and personally. Part of the problem is these techniques don’t fully represent the full financial contribution of marketing investments. Most emphasize only short-term returns (e.g. sales qualified leads) or focus too heavily on measuring the return on a specific media (e.g. the return digital media or TV) rather than the contribution of marketing to cash flow, profits and firm value. The bigger and more fundamental problem is these measurement initiatives are built on a foundation of incomplete, out of date, and poorly classified data about marketing spend. Measurement software is only as good as the data that feeds it. Most marketing measurement systems are compromised because Finance and Purchasing organizations struggle to classify, account for, and report marketing spending in any consistent and financially-valid way. Without better transparency into marketing spend, it will be nearly impossible to put in place more sophisticated and popular measurement concepts like marketing performance management and marketing attribution. “As marketing takes an ever more strategic role — leading everything from growth to product to customer experience — full marketing accountability becomes paramount. Working with finance and procurement to establish a baseline of clean, up to date and properly categorized marketing spend data is fundamental to this journey”, according to Jaime Punishill, CMO of Lionbridge. “Organizations that don’t make near-time, clean, and categorized data a priority will struggle to measure, manage and grow the contribution of their marketing investments, because they cannot even count, classify and track marketing spending in a financially valid way. There are plenty of very good reasons why marketing spend transparency is such a difficult problem. An exploding marketing mix. The mix of investments needed to support growth has exploded as digital, technology, content and owned marketing channels have emerged. According to Forbes research 92% of CMOs are investing in a complex portfolio of 20 marketing, media, channel and technology investments to support growth in their businesses. Most of this investment is not paid media. Today, organizations spend more money on the technology, analytics, content, owned and earned digital and social marketing channels and programs than on paid media to support them. And sales enablement spending is rising as account-based selling and CRM programs have become a backbone of growth. Rarely are these programs fully reported as part of marketing spend or included in fully loaded ROI models. The lack of standards. The marketing industry has not arrived at a standard or consistent way of defining or accounting for this broader investment portfolio with Finance or Accounting. Procurement contributes to the problem because they generally don’t classify, code and break out marketing and agency purchases at a high enough level of detail to support meaningful measurement and spend governance. Media companies exacerbate this problem by focusing media specific research and measurement systems that effectively “grade their own homework”. The fragmentation of spend data. It is hard to collect marketing spend data because it resides in many different systems, budgets, formats, agency contracts, geographies and organizations. Unlike CRM databases, Marketing spend data exists in many different purchase order, payment and ERP systems. Defining, budgeting, and tracking marketing spend has grown more difficult as the marketing function has evolved into a team sport involving sales, product and IT departments. For example, 81% of senior marketing leaders report they are individually accountable for supporting sales channels and driving more measurable sales outcomes deeper into the sales funnel. 1. Define a common and representative way to classify and track the modern marketing investment mix. The mix of investments needed to support growth has exploded to over 20 primary categories and many more sub categories as digital, technology, content and owned marketing channels have emerged. Most finance and purchasing organizations do not break out purchase orders, payments and expense codes into the primary categories that describe growth investment, much less the sub categories needed to measure and manage the performance of agencies, programs and campaigns effectively. Many organizations fail to break marketing spend into the most basic components. This makes managing marketing investment much harder than balancing television ads and sales promotions. 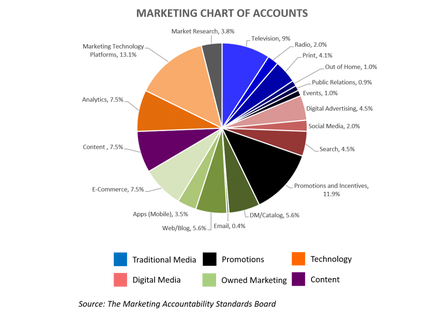 The Marketing Accountability Standards Board has defined a standard chart of accounts that represents the full breadth of owned, earned and paid marketing spend in the modern marketing mix. Instituting a common chart of accounts for marketing with finance and procurement is a fundamental backbone for any measurement program. 2. Agree on how to account for growth investments. There is a general bias among boards, CEOs and financial leaders that marketing is a discretionary expense that can be cut to make earnings and profit targets with limited consequences to the business in the long term. The reality is marketing assets (e.g. technology to support the digital customer experience) and investments (e.g. brand building) contribute much or most of firm financial value. Finance and Marketing executives need to start to separate marketing assets like a robust digital technology infrastructure, from investments that build and protect brands, from expenses that generate leads from waste that adds no value. “The CMO is being asked to raise funds for a multiyear technology roadmap to support the customer experience and multichannel execution, while at the same time balancing short-term demand generation tactics with long-term brand investment”, according to Connie Weaver, a former CMO who sits on the Board of Citizens Inc. “Each objective has a unique set of economics, investments and time frames. Without a long-term commitment to strategic brand and technology platform development, CMOs will not build the critical business advocacy and are being set up to fail.” This distinction will allow marketing and finance to agree on what aspects of marketing spending are muscle (high return growth investments) vs. fat (waste and duplication) and bone (brand stewardship). The inability to make this distinction with any financial rigor is why popular management trends like zero-based budgeting programs being promoted by activist investors and leading strategy consulting firms can be risky and in many cases can destroy value. 3. Streamline and automate the process for coding, consolidating, and classifying marketing spend. Organizations that create executive marketing performance dashboards and put in place marketing performance management software quickly run into a “garbage in and garbage out problem” when it comes to reporting on marketing spend. Marketing spend data is usually found in many places or consolidated in agency or trade partner contracts that are opaque with little line item detail. The spending that supports growth is usually spread across many different business units, geographies and departments depending on how distributed marketing program management is in each company. Best in class organizations streamline the entire source to pay process – from writing marketing contracts, classifying vendors, coding invoices to reporting marketing expenses on the general ledger – to harvest a more detailed, useful and accurate picture of marketing spend from their financial systems. They are using big data analytics and machine learning to aggregate, harmonize and classify spend data directly from financial systems. And maintaining a single source of truth for marketing spend to feed dashboards and marketing performance management systems. Break out the “building blocks” of a multi-channel marketing campaign, brand building investment, or sponsorship program to understand how each department, agency or media property contributes to the collective business outcome by segment, return on investment threshold, and business objective. Itemize, track and optimize vendor funding and retail promotional investment for every product (SKU) they sell to get a true picture of profitability on an item and promotion level. Unpacking department budgets and agency contracts to understand what specific content, data, analytics and channel assets they are building and media campaigns they are executing to evaluate the return on every dollar spent. You can learn more in the Forbes report on Real Time Marketing Accountability and at our upcoming Proving the Value of the Brand executive forums.